It is clear that Dzhokhar and his brother were present at critical moments and at critical places in the day's horrific events, and were involved in a shootout with police. The question is: were they acting alone throughout the entire chain of events? "The widow of one of the Boston Marathon bombing suspects is under active investigation and could face potential criminal charges related to the deadly blast, law enforcement officials told ABC News." More importantly, even if it turns out the woman is not Russell, and she is cleared, the question remains: who was it? Pressure cookers at Macy's run from $150 to over $200, so this is a significant purchase, especially for an unemployed man receiving state welfare benefits. So if it was not Ms. Russell, who was it? The prosecution, and even the defense, if you can a call it that, have settled on a two-lone-brothers scenario, who obtained illegal help from Dzhokhar's college friends after the fact, in ill-advised and morally bankrupt decisions to conceal evidence. But what about before the fact? The FBI cannot say, as it initially tried to, that it did not know who the brothers were, or what Tamerlan was up to, in his long, apparent journey toward jihad. "CBS News reports although the FBI initially denied contacting Tsarnaev, the brothers’ mother said they had..."
A US House of Representatives Department of Homeland Security Committee report, “The Road to Boston: Counterterrorism Challenges and Lessons from the Marathon Bombings," states that while Tamerlan was in the Chechnya region in 2012, after he, his brother, and family had been interviewed by the FBI in 2011, the Moscow FBI office may have intercepted communications between Tamerlan and William Plotnikov, a Canadian who was killed in a firefight with Russian forces that year. Tamerlan left the country two days later. "FBI officials in Moscow indicated that electronic communication between the two [Tsarnaev and Plotnikov] may have been collected. [REDACTED PORTION] These officials also reported that investigators have determined it is unlikely the two met face-to-face while Tamerlan Tsarnaev was in Dagestan." The FBI claims that after Russian intelligence services tipped them off to something amiss with Tamerlan, in 2011, it conducted an investigation, found no ties to terrorism, and then forgot about him. But if they were spying on Tamerlan while he was in Chechnya, they clearly hadn't forgotten about him. Next, it is a simple matter for the defense to subpoena cellphone records for Dzhokhar, to confirm just for good measure that it was indeed Tamerlan that Dzhokhar was talking to, four minutes before the first explosion. Dzhokhar can be seen clearly talking into his phone at this time, and the prosecution basically assumes it is to Tamerlan, which it probably is. But to not obtain the cellphone records to confirm this would cast a doubt, and so the prosecution should produce them. Dzhokhar Tsarnaev speaking into cellphone near second bomb site, four minutes before first explosion. It is said that facts are stubborn things. This goes not just for facts we are presented, but also those we are not presented, but nevertheless remain stubbornly in the background casting their shadow. The Department of Homeland Security report is primarily a compendium of excuses leaning heavily on the government incompetence card, which rings hollow to anyone who has tried to hide earnings or bank accounts from the IRS. The government is very competent where it wants to be, and trots out the "we need to do better" meme when it is lazy, or worse. The fact remains that one Ibrahim Todashev, Tamerlan's friend and perhaps the only person who knew his true frame of mind and of his interactions with the FBI, is now dead after one of the most extraordinarily convoluted self-defense actions in FBI history. Todashev managed to take three bullet entry wounds to the back and one to the top of the head, after supposedly charging at a lone agent with a broom handle. How interesting that anything Todashev knew was buried with him. Autopsy photo released by Todashev family, of three entrance wounds to back. - What seems to be a covert agent of some sort can be seen speaking into an earpiece as the brothers round the corner at the Whiskey Steak House on Boylston Street, with his face blurred out by the FBI in the surveillance video released four days after the bombing. - The incriminating note in the boat in which Dzhokhar was hiding was not revealed until a full month after the bombings, when every other piece of damning evidence was being released as soon as it was found. - Tamerlan was on at least two terror watch lists after he was interviewed by the FBI in 2011. - Other men were present, first with backpacks and then running without them, dressed in paramilitary gear. - The exploded backpack shown as evidence by the FBI was a poor match for the backpacks carried by either of the brothers, which were lighter in color. - In the prosecution's video-still-photo compilation presented to the jury, there is a photo which looks much like the one that Marathon runner David Green snapped which, in a stroke of incredible good fortune, as it was described by the media, happened to catch Dzhokhar fleeing without his backpack (at 9:02 in official surveillance montage.) There is one problem with the photo: it cannot be Green's because Tsarnaev is positioned well to the right of where he was in Green's photo, at the edge of the wooden door. 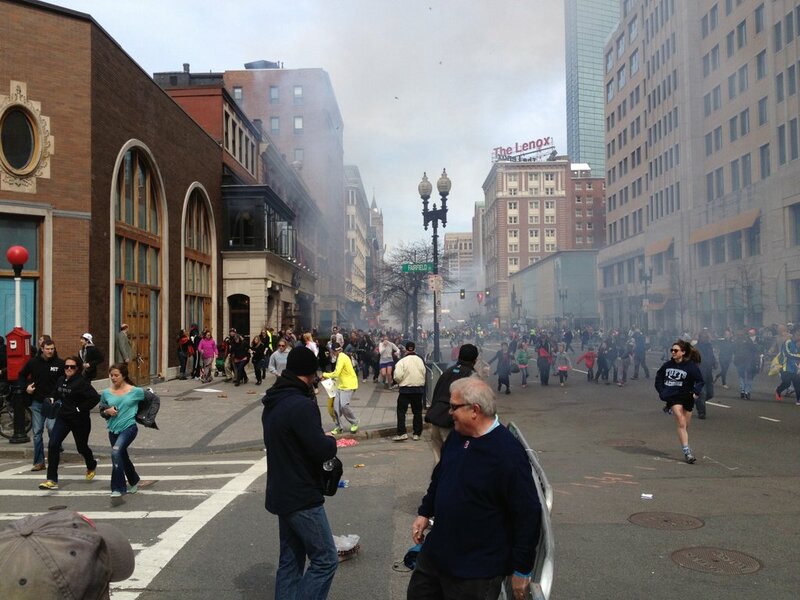 In Green's photo Dzhokhar is already past the brick corner. Green said he only took one photo, telling the New York Daily News: “It was one shot and it was the shot that counted.” Did someone else take a photo at almost the same moment, and from the same vantage point, as Green? There is no reason to think the question does not have an innocuous answer. But the defense should hear it. Detail, David Green photograph, Boston Marathon, 2013. Photo shown to jury in surveillance video, Dzhokhar flush with wooden door. It is important to note that these arguments do not contend that the brothers were not involved in some plot. Clearly police were getting shot at during the chase, and MIT officer Sean Collier was murdered, although the surveillance video is at far too great a distance, and too dark, to make out the faces of the assailants. Rather, the questions which won't go away point to something closer to entrapment, something the FBI has a long and clear track record of using. The schemes are rarely reported in the major media. One exception was Dan Rather's report on the World Trade Center bombing of 1993, in which FBI agents had full knowledge of the plot beforehand, payed some of the players, and failed to stop it. Also little-known is that passengers on the flight which the famous "underwear bomber" was on testify that he was helped to bypass security and board the plane by federal agents, who ushered him through a secure area at the terminal. What? The FBI or other parties violating someone's rights and drugging them into helplessness? Remember, this is the same FBI which lied about ever knowing the brothers, and caught Ibragim Todashev in an apparent midair backflip with three bullet holes to the back and one to the top of the head. One of the prosecution's main contentions over the past two years has turned out not to be true. That is that, as the first bomb blast took place, Dzhokhar did not "react." He clearly did, looking in the direction of the blast like everyone else, then he picked his way in the other direction, apparently without his backpack, and flees. But the backpack is slack and seems fairly light, from the way he handles it. It does not seem to be stuffed with a steel-loaded pressure cooker weighing as much as a 30 pound gym weight. At one point, at 2:10 in the surveillance montage, Dzhokhar is seen sauntering with his hands in his pockets, bag slung on one shoulder, not straining against a heavy load at all. Dzhokhar at 2:10 in surveillance montage. The bomb devices, according to experts, were sophisticated and likely beyond the reach of amateur bomb-makers. As well, it is quite clear that as the wild chase ensued, whoever was giving the orders to law enforcement had no interest in either brother coming out alive. At one point the brothers can be heard attempting to surrender, calling out "We didn't do it!" and "It wasn't us!" At another, as Dzhokhar lay in the boat, police unleashed a barrage into it after which Dzhokhar's survival can only be called a miracle. Was Dzhokhar supposed to die that night, along with his brother? Is his presence in a courtroom today the one thing that was not supposed to happen? Were the brothers playing a part in an exercise or drill, a continuation of the one we know took place that morning at the starting line of the race? One thing is certain. The government gained a new tool that day: the city-wide, voluntary lockdown, in which all good citizens could be counted on to lock themselves indoors at the request of the authorities like inmates in a prison, rather than a free people.